This battery charger is designed to provide safe and reliable continuous and automatic charging. It prevents harmful deep discharge, for example, through a normal discharge (about 1% per day) or because of the lack of Phases in charges that are too short (Short Distances), overload (too many consumers), or possibly as a result of an alternator charge that is too low. The charging voltage can be set to 2 volts, 6 Volts and 12 Volts using the sliding switch. Short-term the charger is protected against short circuit and reverse polarity. Reversals in polarity are indicated by an LED. As a result, next spring you will get a high power battery ready for immediate use. This battery charger is designed specifically for the rainy season and to recharge or charge lead batteries. It charges the battery with a charging current of 300 mA max. This charging current will automatically adjust the charging status, so as to avoid an overload and release of poisonous gases. Once the end of charge voltage is reached, the electronic control automatically reduces the charging current. This protects the battery from harmful overcharging. A load and correct polarity indicator will inform you of the condition of the battery charger. 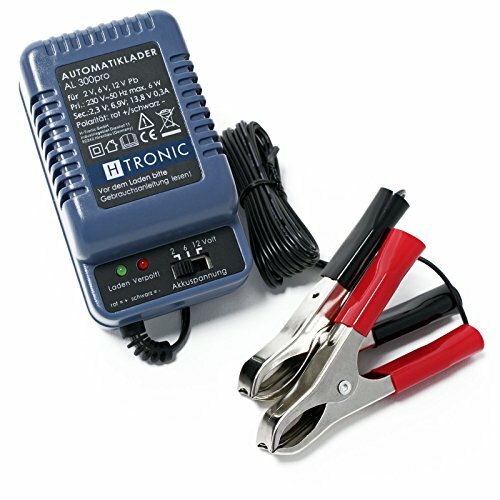 This battery charger ensures that batteries are charged gently (IU) and ensures the immediate start-up of motorcycles, cars, classic cars, boats, caravans, tractors and other devices, which have not been used for months, in winter, protecting the batteries from harmful deep discharges.